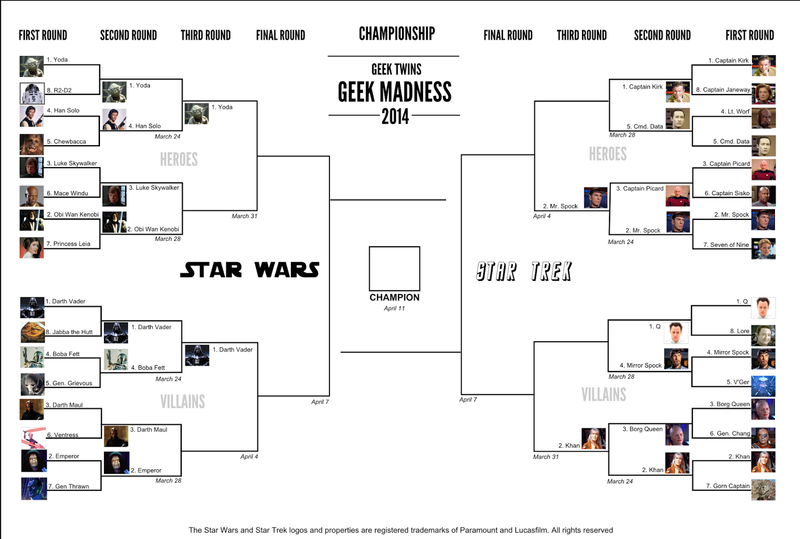 Act now to vote in the second round of the March "Geek Madness" Star Trek vs. Star Wars tournament! Will Luke Skywalker overpower his teacher, Yoda? Will Captain Kirk triumph over Commander Data? You decide! Update: The third round has begun! Go vote now! Welcome to the second annual March Geek Madness Tournament! 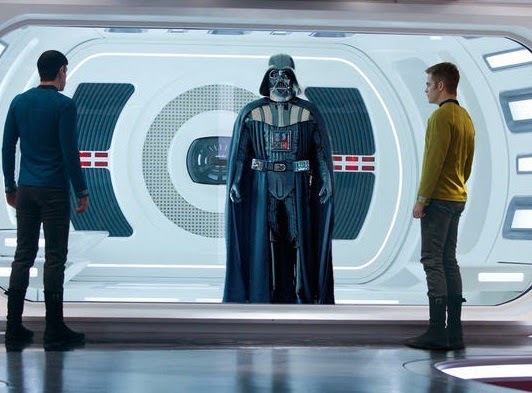 This year, we're pitting Star Trek characters against Star Wars characters. Each bracket is divided into Star Trek heroes, Star Trek villains, Star Wars heroes, and Star Wars villains. In the final rounds, the winners from each franchise will face off. Remember to read this Geek Madness post for all the details on the tournament. 1. Yoda faced Han Solo in the swamps of Dagobah. Han sneered that he didn't believe in the Force, and drew his gun. But Yoda drew his lightsaber first, and took Han down. Winner: Yoda! 2. Darth Vader faced Boba Fett on Cloud City. Boba snarled that Darth was no good to him dead, but Darth force-pushed him into the carbonite freezing chamber. Winner: Darth Vader! 3. Captain Picard faced Mr. Spock on Vulcan. Spock used a Vulcan neck pinch on Picard, and subdued him quickly. Winner: Spock! 4. The Borg Queen descended on Khan in the Borg Unicomplex. The Borg drones swarmed Khan at her command, but Khan outsmarted them all and deactivated her. Winner: Khan! Now here's the voting for round two. Vote now before you forget! *Not affiliated with Lucasfilm or Paramount. All rights reserved. How's your bracket so far? What do you think will happen next? The pictures need changing....it scared me. LOL, yeah, sorry. I just caught them. The Emperor doesn't look like Spock or Data. Mirror Spock! Just kidding. I don't want to be a single cell organism! Great idea for a tournament. I put in my votes.